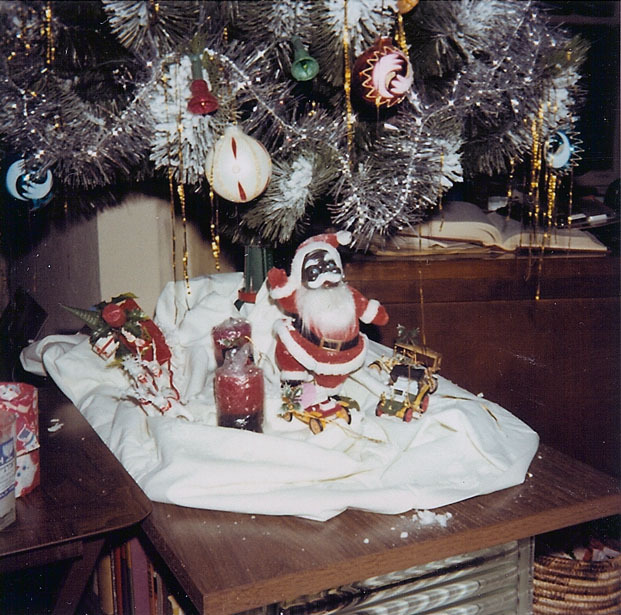 The Santa that my mother put under the tree in 1968, my last Christmas at home. 😀 If I had a letter or some Christmas related writing for 1968 I would have added that, but didn’t have any. I knew “1968” was a Good year! I love it! I got one on my tree this year. What a sweet memory. I love the tree lights and tinsel too. You always take us back Kristin! Heeeyyy, Santa’s black! Don’t tell Fox news! I don’t watch TV so I don’t know what the deal is with black Santa. What happened? Great photo……we caught a couple of good deals on Black Santa’s after the holidays. love it! One of the blondes from Fox News said that of course both Santa and Jesus are white and it’s just an attack on Christmas and “the facts” to say otherwise. Have you kept those ornaments in the family? Lovely to have the photo. I don’t know what happened to this Santa. I’ve never really been into Santa so I didn’t pay attention to where they went. I have a feeling my mother left a lot of decorations when she moved out of Detroit. All my grandparent’s Christmas decorations are missing too.